Of Russian and Tunisian origins, Doria Achour embarked on her cinema career at a very young age, alongside Sergi Lopez and Sylvie Testud in Les Femmes… ou les enfants d’abord by Manuel Poirier in 2001. She continued with L’Ennemi Naturel by Pierre-Erwan Guillaume, L’Annulaire (The Ring Finger) by Diane Bertrand and L’École pour tous by Eric Rochant. 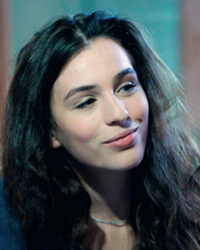 Doria Achour has a diversified portfolio, as she did stage and television work and starred in two short films: Le Cas de Mathieu by Pietro Izzo and La Beauté cachée des Laids by Johan Mohamed-Cassim. In 2013 she was praised for playing the lead role in Cheyenne Carron’s film La Fille Publique. The following year Doria Achour made her first short film, After the first blaze. The film was selected in festivals such as Carthage, Grenoble, Rome and Aguilar. It won the Public Prize at Made in Med Festival (European Union) and a prize at the STIFF. Last October, she played the central role in Sylvie Ohayon’s Papa Was Not a Rolling Stone with Marc Lavoine, Sylvie Testud and Aure Atika. 2015— Doria Achour has written the screenplay of her first feature, Samovar. She is also starting the development of a TV series about teenagers. As an actress, she has just finished shooting Burning Hope, directed by Lotfi Achour, and as a director, she’s shooting her second short film this summer, All the rest is the work of man.